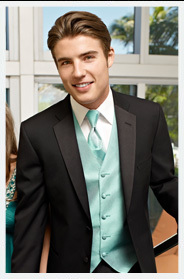 This look is a classic tuxedo look that will make any man stand out at a formal event. 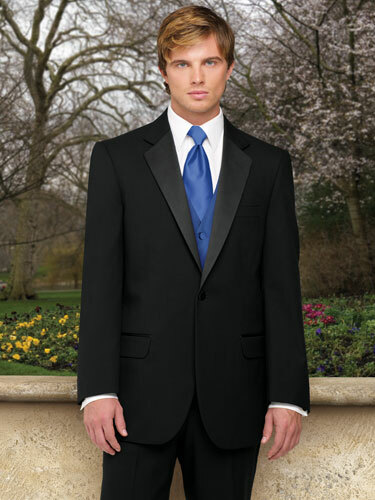 It is a stylish wool tuxedo with notch lapels with satin edges. This style is available with just the tuxedo, but you can also add a classic bow tie, neck tie, vest, or cumber bund to complete the look. Going for a classic look at your Black-tie event and want to make sure you and your date match? 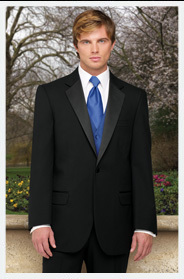 This tuxedo is the perfect way to set yourselves apart from the crowd. This is a two-buttoned, single breasted jacket with a satin diamond lapel. Match your date with a vest and tie the same color or pattern as her formal dress! 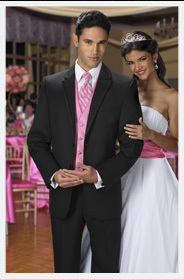 Nothing beats the classic look of a sleek two-button tuxedo jacket with a stylish satin, notch lapel. This handsome style can be paired with any number of patterned vests and ties.